The star piece of my routine is definitely the GHD Aura Hairdryer. My hair can go from roughly towel dried to completely styled in around five minutes, which is pretty darn good! The nozzle and the way the air flows means you can specifically target one area of hair at a time, which is good if you have a fringe and want to keep hair sleek around it like I do. 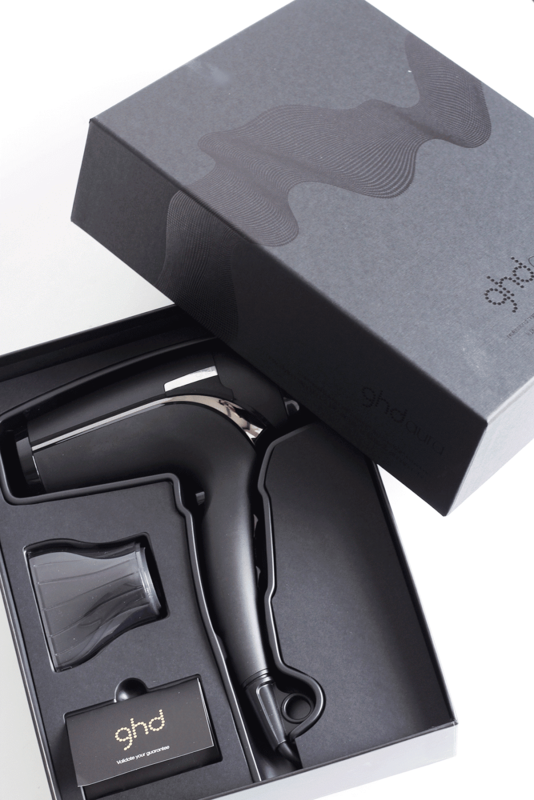 It has multiple heat settings plus a button to blast cool air to keep your hairstyle in place. I really love this hairdryer, as it’s not too heavy or loud making it ideal for everyday use. I think it’s sleek in design too and matches perfectly with my GHD straighteners (8 years and still goin’ strong!). 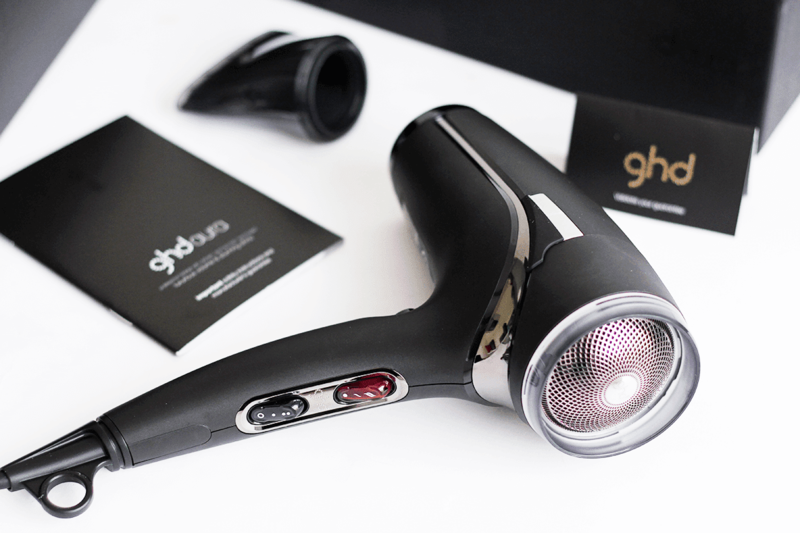 Definitely consider this as your next purchase if you’re in the market for an effective, functional hairdryer that gets the job done and leaves you with smooth locks in the process. As for the rest of my routine, let’s go through it from start to finish? So, I roughly towel dry my hair and use Kerastase Serum Therapiste if my hair needs a bit of TLC which it has been lately. I’ll spritz in a bit of Schwarzkopf got2be Guardian Angel if I know I’m going to be straightening or curling my hair to protect it from the high heat and reduce damage. 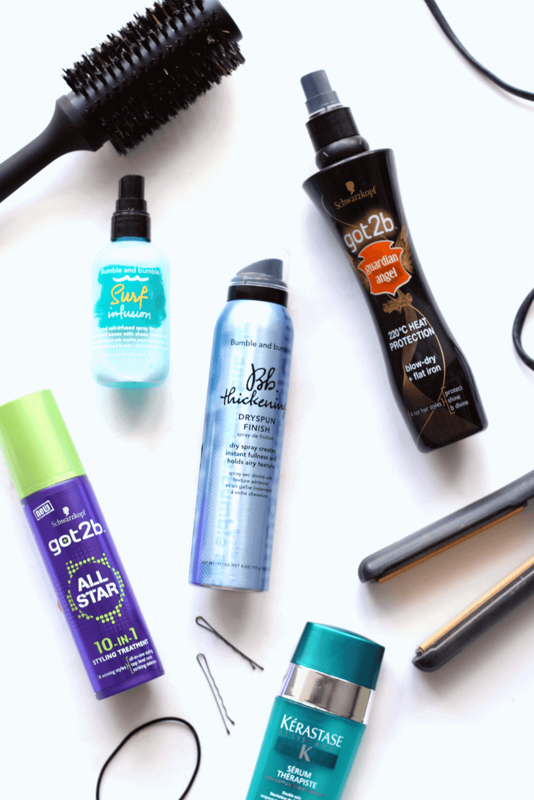 I then spray in some Bumble and Bumble Surf Infusion if I want my hair to have a bit of texture and fullness, as this spray is perfect for adding that surf look without the crunchy feeling! I’ll then dry my hair and finish with some Bumble and Bumble Thickening Dryspun Finish which is my favourite spray – I’m nearly finished this can and I could cry as it’s the best at giving your hair so much oomph! Orrrr if I’m feeling entirely lazy, I’ll throw in some Schwarzkopf got2be All Star 10-in-1 Styling Treatment, which does pretty much everything in one from adding fullness to repairing damage. One to look out for if you’re a lazy girl like me! Full review coming soon no doubt. What do you use in your haircare routine? Also, check out my newly updated blog sale as it has to go by Saturday and see my £250 my Barbour giveaway! Phew.